These last few weeks have emphasised the difficulty of advising, in advance, the locomotives to be rostered for our services, and never has the disclaimer at the foot of these notifications been more appropriate. The fire risk continues and our trackside is still tinder dry, resulting in the Railway, reluctantly, replacing Thursday’s steam locomotive with one of our diesels but, as yet, there is no blanket steam ban on the KWVR and steam passenger services continue whenever possible. This weekend, with the usual disclaimer, will have ‘Big Jim’, USATC S160 2-8-0 5820, at the head of steam services on both days and will continue with the weekday service. On Sunday 5820 and will be joined by Ivatt 2-6-2T 41241 on our Sunday Vintage Train service. However conditions were favourable last weekend for the preferred locomotive, LNWR ‘Coal Tank’ 0-6-2T 1054 to head the Vintage Train. These are tricky times and we ask for understanding if the advertised locomotive is substituted. The diesel service this Saturday will be locomotive hauled with our monthly Diesel & Ale train running throughout Saturday alongside our steam hauled service. This will be hauled by Class 37, 37 075. 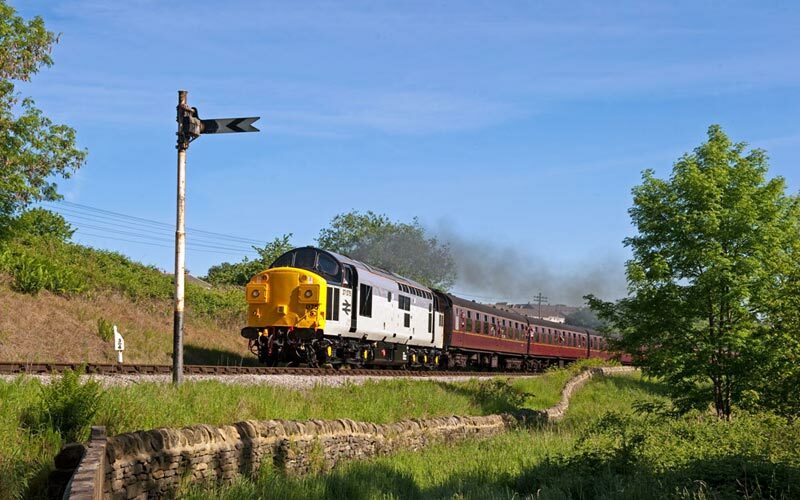 On Saturday (Green Diesel & Ale Timetable) the first train departs Oxenhope (diesel) at 09.00 with steam locomotive trains operating from 11.00 and on Sunday (Blue Vintage Train Timetable), the first passenger service is steam hauled at 10.15. 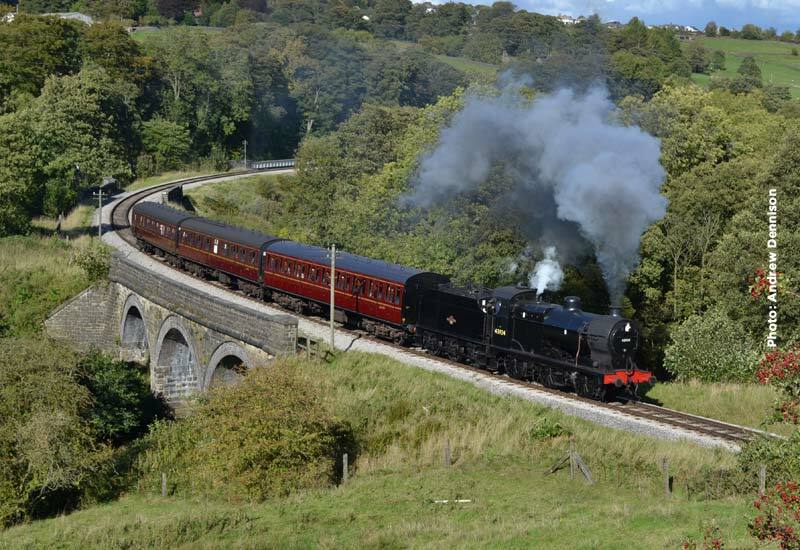 WD 2-8-0 90733 will be at the head of midweek running this week from Oxenhope to Keighley. 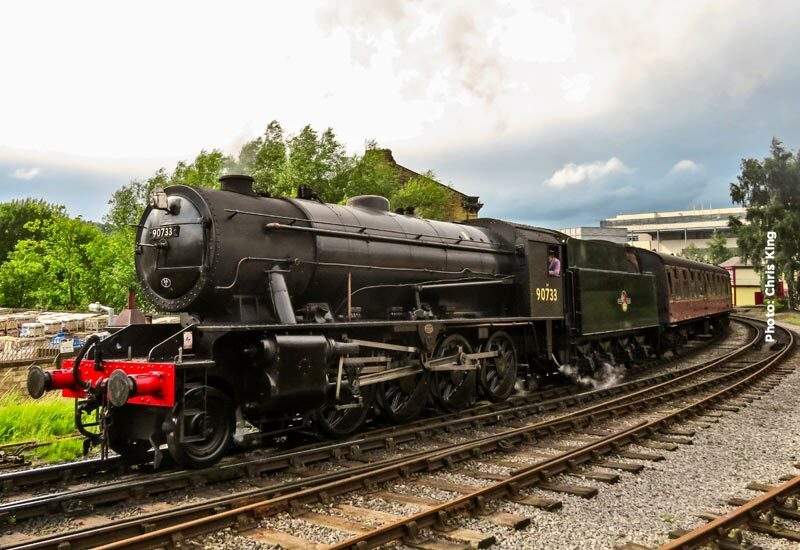 This weekend sees BR Class 4MT 4-6-0 75078 replace 90733 and will operate on both days of the weekend. 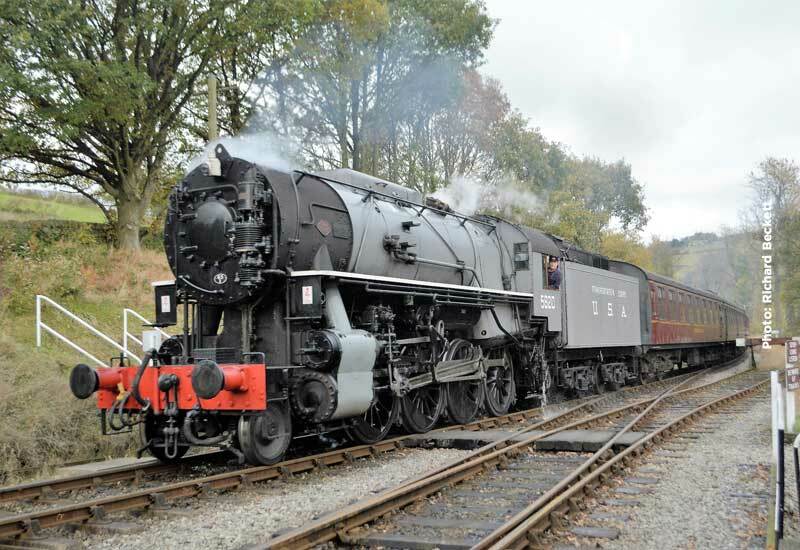 On Sunday MR 4F 0-6-0 43924 will be introduced on the relief set. Saturday sees the penultimate end of month diesel and steam Saturdays which this Diesel & Ale Saturday will have English Electric Class 37, 37 075 providing the diesel service throughout the day when the buffet will be sponsored by Bradford based, Salamander Brewing Company serving a selection of their own real ales throughout the day. No sooner has Easter passed and another holiday period starts with a 3 day full 2 train service Saturday – Monday. The weekend starts with a modified Green timetable on Saturday with a full line all day mainline diesel hauled service commencing at 09.00. 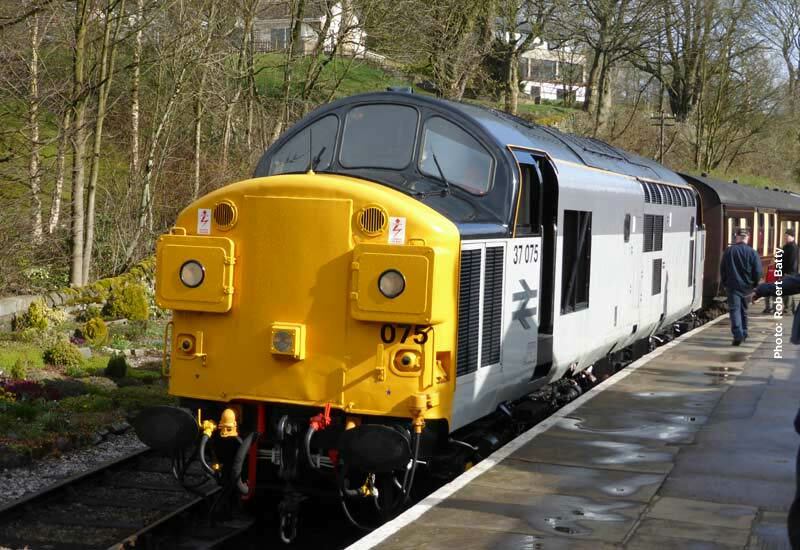 This service, the first of our mainline diesel hauled days, will be in the hands of BR English Electric Class 37 locomotive 37 075. 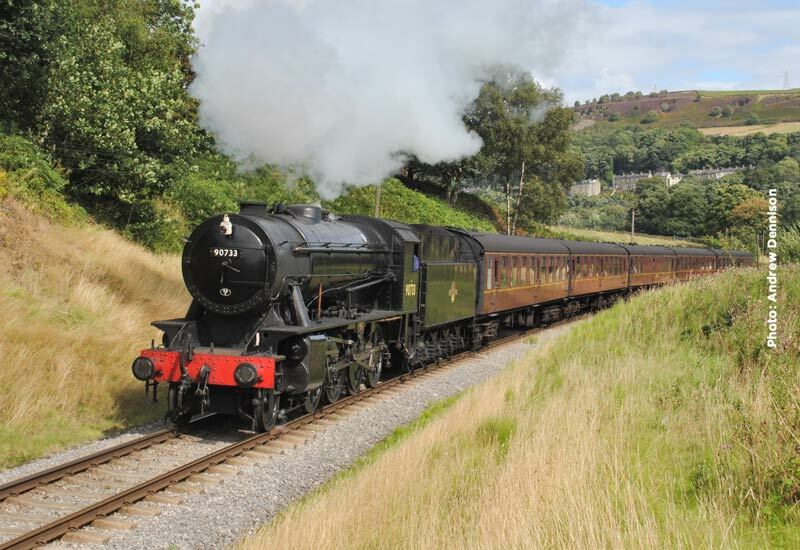 At the head of the steam hauled passenger train will be WD 2-8-0 90733. 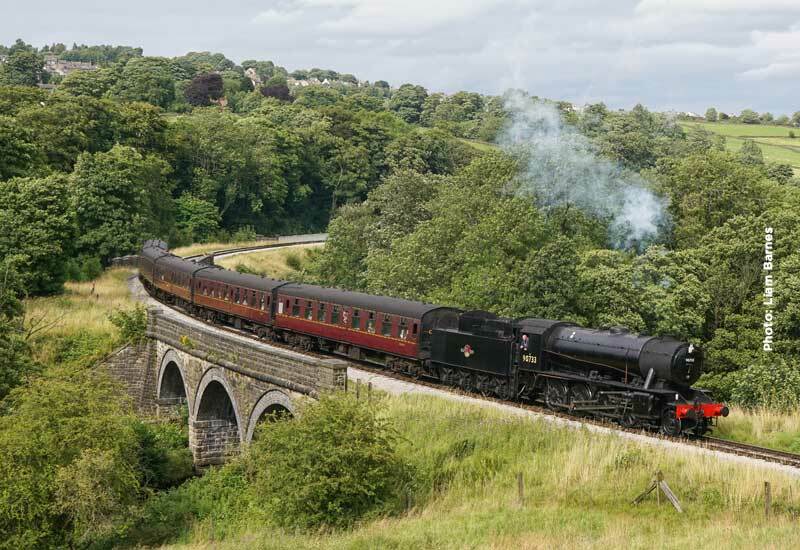 On Sunday the Tour de Yorkshire cycle race passes up the Valley and we are operating a special all steam timetable starting at 09.30, continuing throughout the day. 90733 will be joined by BR Standard 4MT 4-6-0 75078 for the Sunday services and on Monday when the Blue timetable will operate. We trust that the original post did not cause too much confusion or inconvenience. This weekend sees the second of the Railway’s steam and diesel Saturdays. 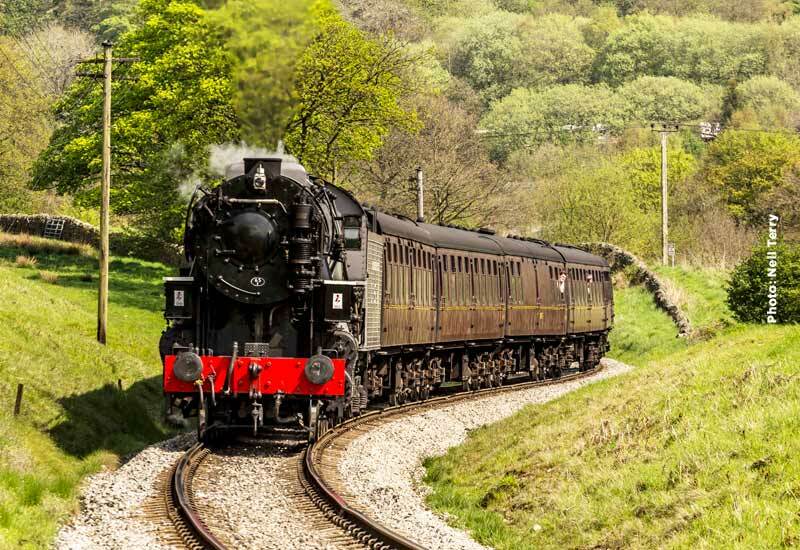 A special timetable operates in conjunction with the Steam & Ale Trail with the all line railcar turns taken over by locomotive hauled passenger stock. 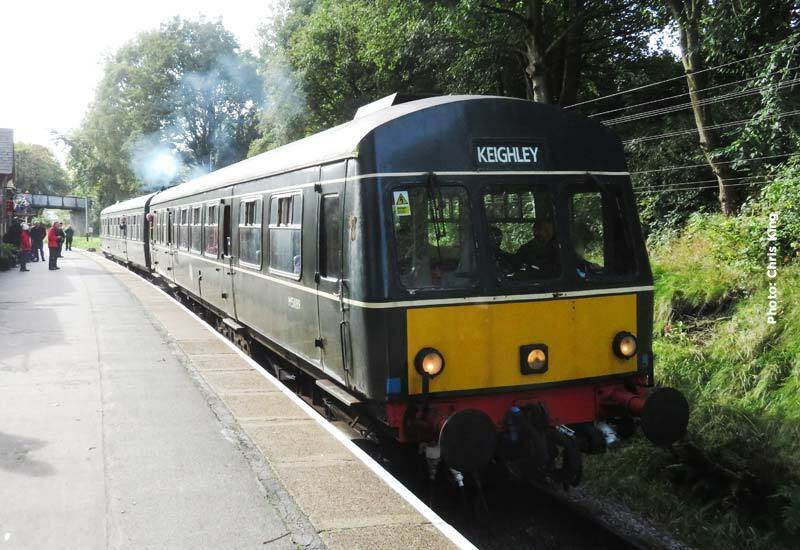 However the Class 101 diesel multiple unit will also be out and about, operating a Keighley – Damems shuttle in between the all line services. 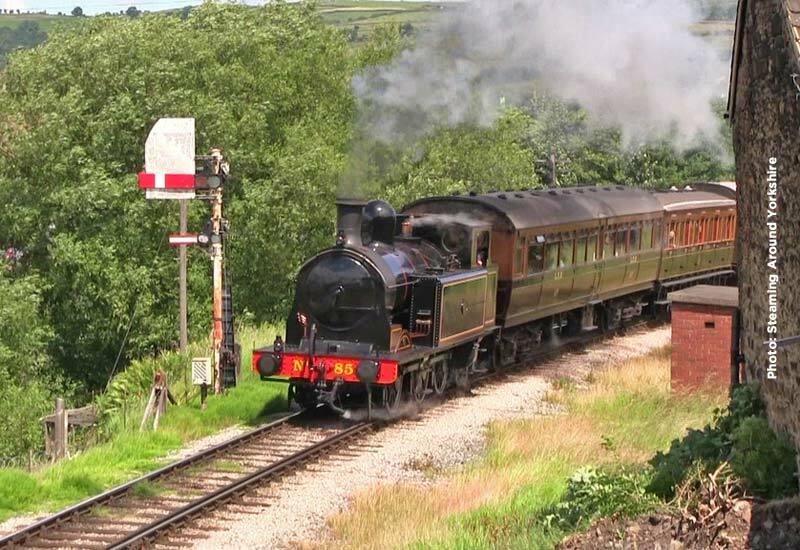 This service departs on the arrival of the train from Oxenhope. 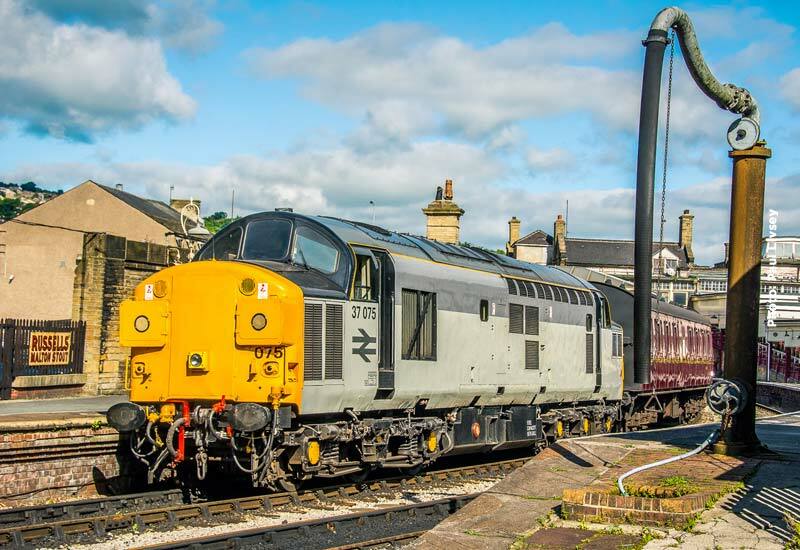 Keighley will be a hive of activity with steam, mainline diesel and railcar services arriving and departing all day. From the first service in the morning at 09.00 to the last diesel service of the day, motive power will be provided by English Electric Class 37 37 075. Sadly, this year, we will not have two WW2 locomotives in operation as USATC S160 2-8-0 5820 has been withdrawn for essential repairs. This year WD 2-8-0 90733 will be joined in action by MR 4F 0-6-0 43924. 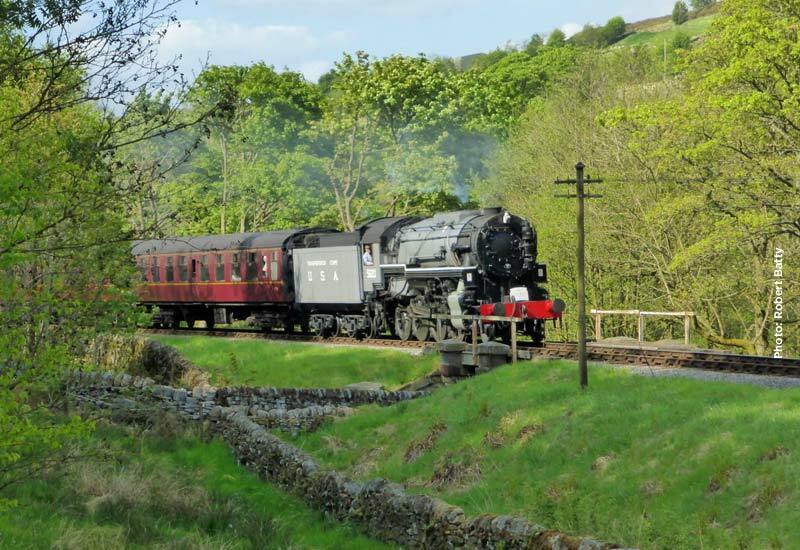 In a role that they have made their own since the dedication ceremony at the 2014 Haworth 1940s Weekend, the locomotives on duty this year are the Railway’s two wartime locomotives, WD 2-8-0 90733 and USATC S160 2-8-0 5820. This weekend sees the first of the Railway’s steam and diesel Saturdays with the railcar turns taken over by locomotive hauled passenger stock, in response to requests from diesel enthusiasts for more diesel locomotive haulage. From the first service in the morning at 09.00 to the last diesel service of the day, motive power will be provided by English Electric Class 37 37 075. This means that there is a full 2 train service in operation. On the steam services, WD 2-8-0 90733 will be in operation on all 3 days being joined for Sunday and Monday by BR 4-6-0 4MT 75078. With 90733 withdrawn for essential maintenance having missed last weekend’s booked duty on Sunday, when 75078 substituted, USATC S160 2-8-0 5820 will be on duty for this, the final Santa weekend of 2015. 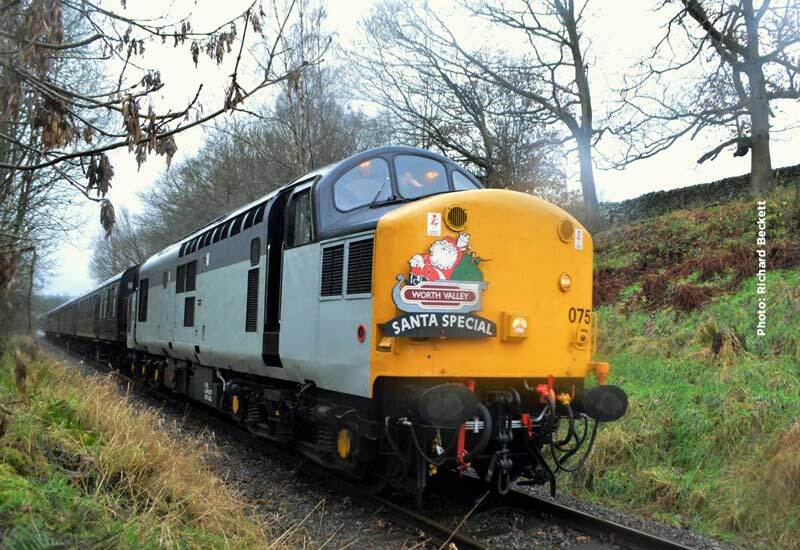 On Saturday BR 4MT 4-6-0 75078 be taking Santa on his journey south with Class 37 diesel 37 075 providing power at the north end on Saturday and 5820 with Class 20 031 on Sunday. 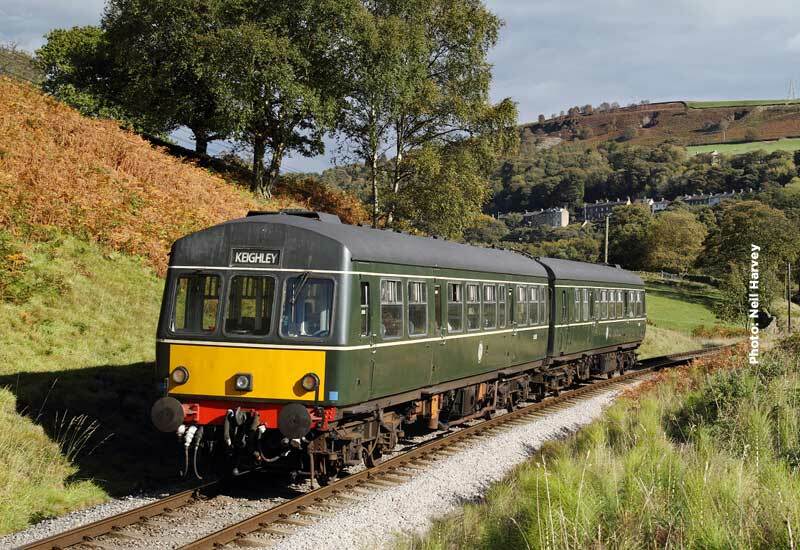 The diesel service, which operates all day on both days and is free to those holding Santa Special tickets, will be in the hands of our class 101 diesel multiple unit. The first Santa Steam Special weekend had its fair share of wind and rain and hopefully this weekend will prove better for our locomotives and crews who had to survive gales and monsoon rain on both days. This weekend will have the same combination of locomotives with BR 4MT 4-6-0 75078 on Saturday and WD 2-8-0 90733 on Sunday. The north end traction will be provided by Class 37 370 075 on Saturday and Class 20 20 031 on Sunday. Firstly apologies for the erroneous news item, posted earlier. 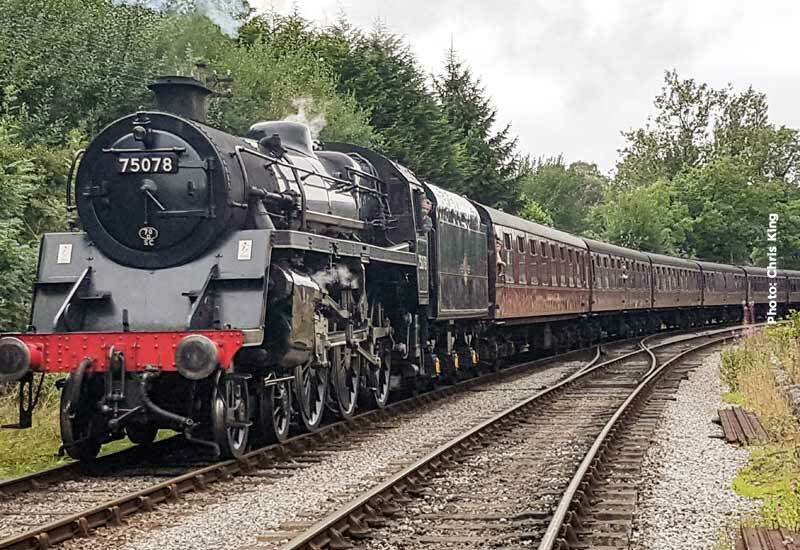 Following the substitution today of BR Standard 4 75078 due to technical difficulties with S160 2-8-0 5820, 5820 is sidelined for essential repairs and 75078 will be in action Friday – Sunday. 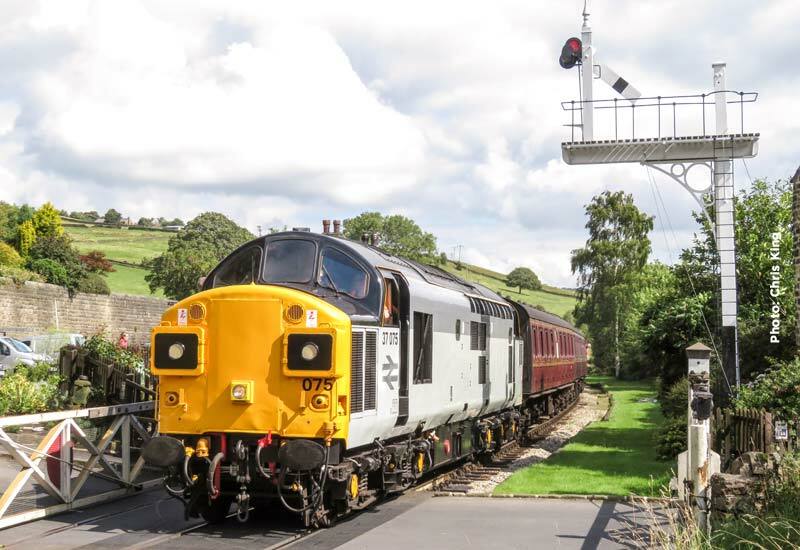 On Saturday 75078, therefore, will operate the steam service with the Saturday diesel locomotive hauled train in the hands of Class 37, 37 075. 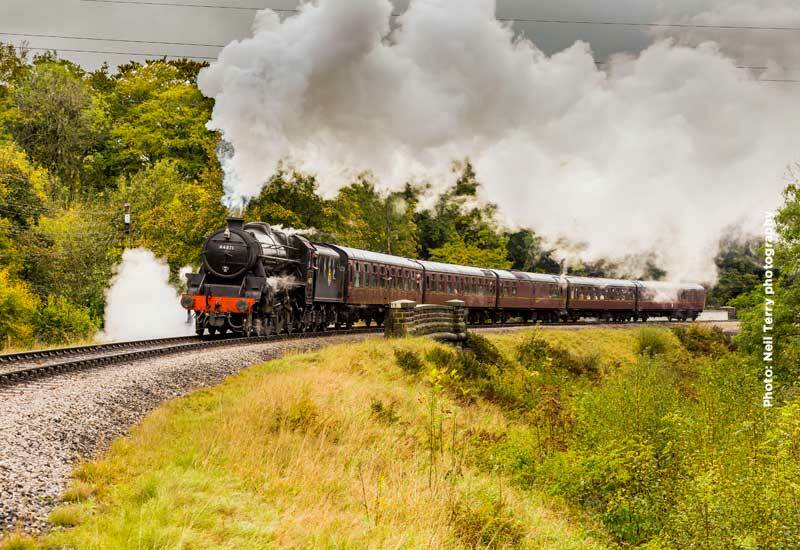 Sunday will see 75078 on the last in the series of Pullman Luncheon Dining Trains in the relief path with MR 4F 0-6-0 43924, as advertised, taking the main service set. Diesel Class 101 will take the morning diesel service.